Miami Trace sophomore Tyler Eggleton chips onto the No. 1 green at the Club at Quail Run during an SCOL match against Chillicothe Wednesday, Aug. 31, 2016. Eggleton shot a career-best 9-hole score of 38 for the Panthers. 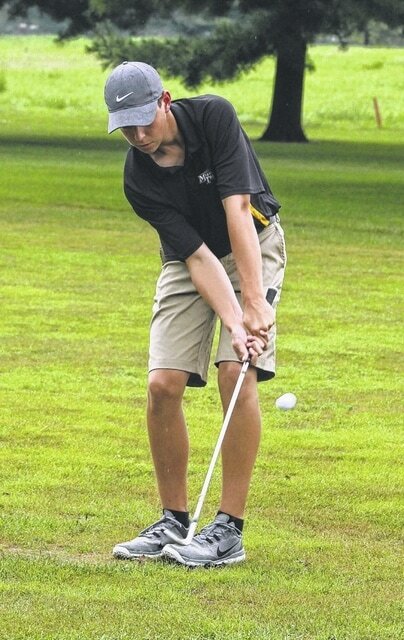 The Miami Trace Panthers golf team rolled to a 60-stroke victory over visiting Chillicothe Wednesday, Aug. 31 at the Club at Quail Run. The Panthers shot a 167 to 227 for the Cavaliers. Mitchell Creamer shot a 36 to capture medalist honors for Miami Trace. That was a season-best score for the senior. Creamer is now one-under par (71) in his last two matches. He shot 35 at Majestic Springs earlier in the week. Tyler Eggleton shot a 38 for the Panthers. This was a career-best score for the sophomore. Hayden Walters had a score of 45, Cameron Carter shot a 48, Ashton Cox had a 9-hole score of 50 and Jacob Batson, a 53. For the Cavaliers, Nick Haller led with a 48. Meyer had a 51 for Chillicothe, followed by Daniel Haller with a 62. Joe Mihelich shot a 66, Eric Corey a 67 and Wright, 73. Miami Trace will now enjoy the Labor Day weekend before getting back to action on Tuesday, Sept. 6 at the Elks Course in Hillsboro for an SCOL match against the Indians. https://www.recordherald.com/wp-content/uploads/sites/27/2016/09/web1_TylerEggletonMT-golf-831-2016.jpgMiami Trace sophomore Tyler Eggleton chips onto the No. 1 green at the Club at Quail Run during an SCOL match against Chillicothe Wednesday, Aug. 31, 2016. Eggleton shot a career-best 9-hole score of 38 for the Panthers.